From locks to thermostats, our home gadgets are getting smarter and connected. You can control your smart home devices using Google Home. What Are Smart, Connected Home Devices? Many of today’s home devices operate beyond their physical components. They are now smarter and connected. The physical aspect of a home device refers to the electrical and mechanical parts. In August smart lock, the batteries and deadbolt parts – the thumb-latch and turnpiece – are the physical components of this home gadget. The smart aspect of a home device refers to the computer hardware and software components. Smart components include microprocessors, data storage and sensors. The hardware and software components of standard computers – desktops or laptops – greatly differ from the smart devices. For one, smart devices are smaller compared to standard computers. A standard computer is meant to accomplish a number of tasks, including researching, calculating, recording and other tasks. A smart device, on the other hand, is typically meant to do a specific job. In the case of the August smart lock, its specific purpose is to keep the bad guys out and keep the good guys in. The connectivity aspect of a home device refers to the ports, antennae and protocols enabling wired or wireless connections of the device. Connectivity comes in three forms: one-to-one, one-to-many and many-to-many. This refers to a device that connects to the user, the manufacturer or another product. An example of this type of connectivity is when the Nest camera indoor is connected to the user’s smartphone through the Nest app. This refers to a central system that’s connected nonstop to many products simultaneously. An example of this type of connectivity is that of Tesla cars connected to Tesla’s single system that monitors and conducts remote service and upgrades. This refers to multiple products being connected to various other products. For this type of connectivity, Google Home plays a big role. 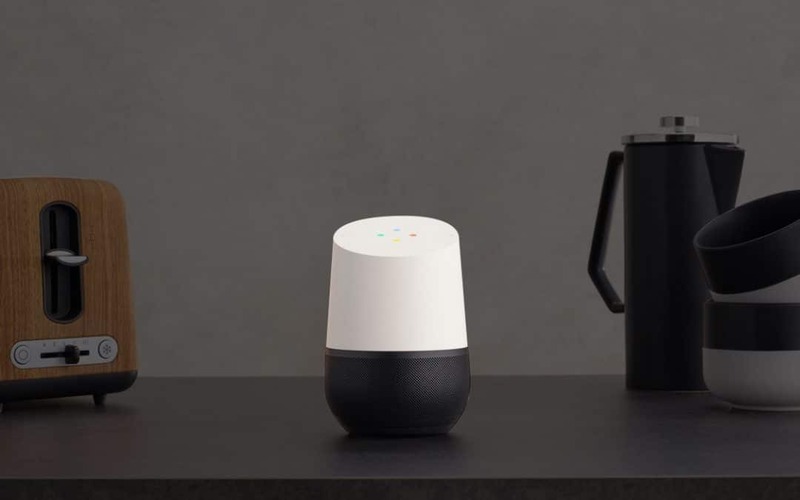 Google Home is a multi-purpose home device. At the heart of Google Home is Google Assistant – an artificial intelligence (AI) – that enables you to do myriad of tasks. The list of things that Google Home can do keeps getting longer. It plays music from the cloud based on your preferences. It contextually answers your questions. It manages your alarms and timers, your to-do lists and shopping lists. It can call any phone number for free in the US and Canada. Most importantly, it can connect and control other smart home devices. You can do all of the above-mentioned tasks by simply activating Google Assistant through your voice or simply by saying “Ok Google”. This AI assistant is also multi-lingual. It can understand English, German, French, Brazilian, Portuguese and Japanese. Later this year Google will add Spanish, Italian and Korean. It can also support multiple users. No need to worry though as it can differentiate your voice from others in your home. Chromecast, formerly Google Cast, is a small device that plugs into a speaker or TV, allowing you to stream audio or video from your phone, tablet or laptop right to your TV or speaker. You can also connect Chromecast-connected TV or speaker to Google Home. For example, you can use your voice via Google Home to search YouTube videos on your Chromecast-connected TV. To do this, ensure that your Chromecast-connected TV and Google Home are on the same network. Open then your Google Home app and look for the “TVs and Speakers” tab under the “More settings” tab. From there, tap the plus symbol located at the bottom of the screen. You can connect your August smart lock with Google Home. In order to connect these two devices, you need the August Connect – an accessory that plugs into any power outlet near your August smart lock and connects your smart lock to your home WiFi. You also need to download the Google Home app. There are two ways to connect your August smart lock and Google Home. For option 1, after setting up Google Home, launch the Google Home app. This message “Link to August” will appear in the “More Settings/Services” section of the Google Home app. Tap the “Link” and then login to your August account. For option 2, after setting up your Google Home speaker, launch the Google Home app, then go to “More Settings”. From there, tap “Services” and then find August home. From this August home, if you’ve already said “Ok Google, talk to August” and still haven’t connected your August and Google accounts, you’ll see a “Link Account” option. Once the August and Google are paired, you can then tell Google Home, “Ok Google, tell August to lock the front door” or “Ok Google, ask August to check the front door”. The good thing about Nest products – Nest thermostat, Nest smoke and carbon monoxide alarm, Nest camera indoor, Nest camera outdoor – is that these products are owned by Alphabet – the same company that owns Google. All Nest products can be integrated or connected with Google Home. Tap Menu and then Home control in the top left corner of the Home screen. In the “Devices” tab, at the bottom right tap “Add”. Tap the device you want to connect to Google Home and then follow the steps. When the pairing of a particular smart device with Google Home is complete, tap “Done”. There’s no limit to the number of smart devices you can link to Google Home. When you need help making your home smarter, give us a call and we will be happy to help. Home to massive juggernauts such as Google, Apple, and Microsoft, the United States is often assumed to be the technology center of the universe. But according to PC Mag, as late as 2016, more Canadians were online than Americans. Yet only a percentage of those residents are harnessing WIFI home automation to really maximize their internet use. The good news is, it can be as simple or as technical as you want it to be when considering how to upgrade and “smarten” your home. Read our article and you’ll be on your way to graduating first in the home automation class! Often, you just need to walk somewhere and you’ll be prompted to hook into a WIFI zone. But one of the last places we think about with WIFI is where we may spend the most time – our own homes. And anyone who has exceeded WIFI data limit and got hit with massive surcharges knows it’s easy to do. Just watch a couple of movies or stream a few hours of songs a month and you’re in danger of going over your WIFI. So take the time to learn about how home automation systems, smart home connectivity, and WIFI now and your wallet will thank you later! We just mentioned a typical use for WIFI (streaming media) but there’s so much more. When you choose to really amp up your WIFI automation, the options are just about unlimited. If you’d like to ease into WIFI automation within your home, look no further than your existing mobile devices. Many automation enthusiasts start out with getting some help – from a digital assistant, that is! You’ve probably heard the names already, Alexa, Siri, Echo. These are some of the big conglomerates’ offerings onto the automation market. You may have even used one of these “services” before – instead of actually using your phone to do something such as look up a restaurant’s opening hours or find a movie time, you simply say, “Hey” and demand the information. And the “assistant” fetches it for you. Less typing and more accurate, faster information, but the digital/virtual assistants do much more. In your home, you really can become the king or queen, using automation. Sure, the mood lighting, music options, and media picks are great ways to maximize your WIFI home automation systems. But one of the biggest benefits hits you straight in the wallet. Many times when we implement upgraded systems, we do it for those systems’ impact on our lives, but we pay for it. Yes, you’ll still have to pay for WIFI automation options, but in many cases, you get paid back. Some WIFI home implementations can nearly pay for themselves, such as what you choose to do for your temperature. Implementing WIFI home automation can mean savings outside the wallet, too. An article from the Massachusetts Institution of Technology notes that wireless technology can actually make a home safer! Yes, the research was done primarily on the association of drones with WIFI technology, but it also rings true with home automation (whether or not you plan to automate pizza delivery to your home via drone!). As mentioned in the research, WIFI means safety and password peace of mind. Sync up your devices and automation to one hub and you’ll only need one password for them all. Ever try to do something (in a rush, of course) and forget your password? Maybe you want to lock up your house remotely before leaving on a vacation, but you can’t remember your credentials. You may have to make a couple of login attempts before you’re locked out or able to request a password change, and then you have to wait. And wait…Until that email arrives. Smart home technology offers an option to sync everything up to one single stored secure password. Whether you decide to full on automate everything in your home at once or ease into WIFI home automation room by room or device by device, it’s your choice. There are budgets for every kind of installation and ranges for pricing smart devices to replace your not-so-smart ones. Think about it: we didn’t get to our totally plugged-in, social-media-addicted world in one day. Sites, apps, and services gradually worked their way into our world. So there’s no shame in jumping into WIFI home automation slowly or plunging into the deep end of the pool immediately. It’s your home and your comfort level! So people are sometimes shocked and worried to think that their WIFI home automation may be used to spy on them. The idea is that your WIFI smart tools are smart for a reason – they connect to something, somewhere, out there in the world, to get the information they need to serve you. It’s really a choice of what you’re comfortable with. You can accept that some home automation may transmit personal information (this California Institute of Arts & Technology article notes that WIFI routers can send data on in-home movement, detect speech from mouth movements, and track lighting and sound) and see it as a tradeoff for all the benefits you really do get. If it seems like the benefits of WIFI home automation are skewed towards homeowners, with options like smart thermostats and water softener upgrades, renters have some options, too. One of the best options is to simply study some of the emerging information on the benefits of WIFI home automation and bring it to your landlord. Present the details on savings and efficiency (especially if your landlord – not you – is responsible for bills for heating and WIFI), then ask about helping upgrade the WIFI automation options. Then, feel free to take things into your own hands. No, we don’t mean buying and installing massive WIFI upgrades you’ll have to leave behind if you move out. Get that digital assistant and/or take advantage of minor WIFI automation options such as hubs and networking options. The key to keep in mind is your security deposit. You want it back, right? So when you make WIFI “rental” automation upgrades, plan to leave no trace behind. Your installs should be all plug and play or grab and go. Although the famed television series and follow up movie “Get Smart” wasn’t filmed in Canada, there are so many ways that Canadians can get smart about WIFI home automation. Start with a free call and we’ll help educate you on the path to the front of the class! Click here to call, email, or hook up with us on social media. You can even read what some of our customers are saying about their own WIFI home automation upgrades/installations. We love to talk about WIFI automation – and you won’t be talking to a virtual assistant, either! You’ll get a real person who will help you begin to build your WIFI home systems and help you realize the savings, efficiency, and enjoyment of a truly smart home.